Happy day after Easter, everyone. This recipe may be a day late, but as you’ll see later on in the Cost Calculator, not lacking in dollar value. Admittedly, the most important Christian holiday has little significance for me other than being a time to see my family, and together obsess over having something really nice to eat. (Is that so sacrilegious?) The fruit of this year’s obsessions was a nice rack of lamb, French trimmed by the butcher, and simply roasted. Now, I’m not going to “kid” you: lamb is expensive, and not as common to come by as other meats. It wasn’t always this way. Before lamb joined the ranks of delicacies like quail in this country, it was widely eaten by average middle-class folks of my father’s generation. But here’s something that may hold a clue to its gradual decline: not everyone in his family liked it. Some of them actually hated it. You cannot mask the natural gaminess — the funk — of this meat; you either like it or you don’t. I imagine the scenario at his family’s dinner table in the fifties as strikingly similar to the one I experienced my Easter dinner yesterday. My uncle, who is Chinese, found he detested lamb. He’d never encountered the meat unless heavily seasoned, like in a curry. So he winced with every bite, and pushed morsels around on his plate in vain attempt to drown the funk in reduction sauce. 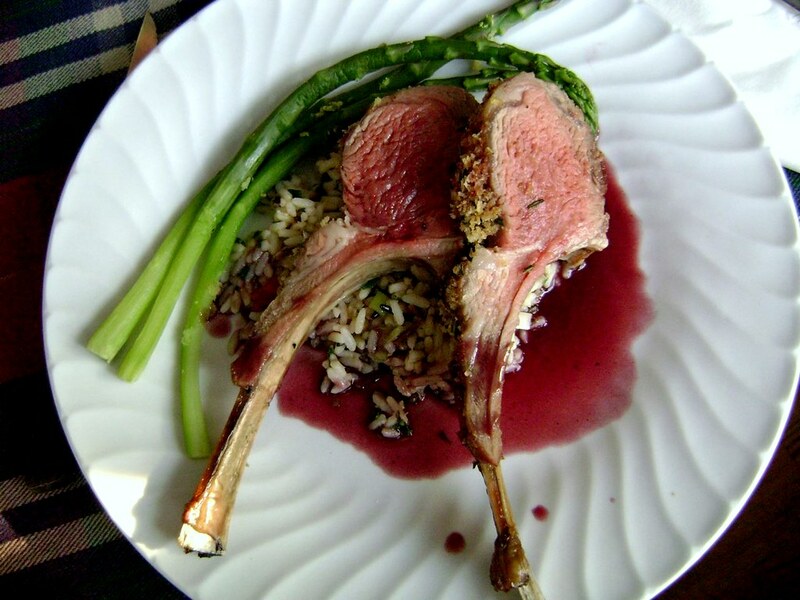 I find its unusual taste rather seductive, and the association of eating lamb for special occasions and holidays makes it all the more refined in my view. Plus, served like this, the lollipop chop is ever so dainty, yet so tempting at the same time to just pick up and gnash at with barbaric glee. Even though I finished my plate, I joined him afterward in gorging on a store-bought sponge cake with ice cream and berries. I really wanted to make a pomegranate reduction, but when my plans were foiled (fresh pomegranates out of season? No way! ), I settled for a straightforward red wine reduction. I tossed out the bogus MSG-ridden seasoning packet from a package of wild rice, and substituted it with fresh herbs, a roasted tomato, scallions and a few pinches of spices. On the meat, a simple garlic, salt and pepper marinade was later buffered with fresh rosemary and breadcrumbs — no mint this time, either jellied or fresh. Ah. Don’t you just love cooking? Marinate the meat: Smother the trimmed racks of lamb with the chopped garlic, olive oil, and a few pinches of salt and pepper. Cover and refrigerate 2 hours, or up to overnight. 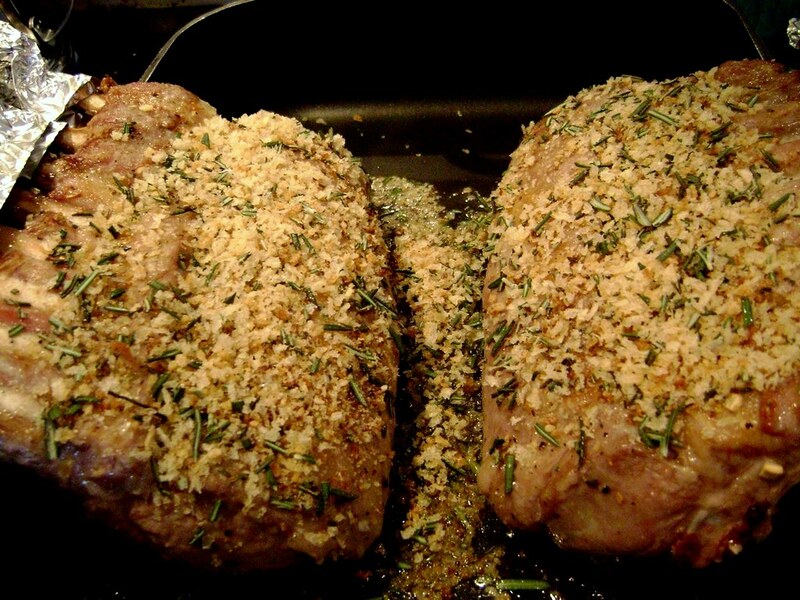 Remove from the refrigerator about half an hour before roasting to bring to room temperature. Preheat oven to 500 degrees. Place tomato on a baking sheet or foil and bake for 5-10 minutes or until skin has blistered. Remove and cool before chopping up very finely, skin and all. Cook the rice: Bring the stock or water to boil and add the rice and 1 tablespoon of the butter. Let boil a minute, then reduce heat to low and cook partially covered, about 15 minutes (or follow the packet’s specific instructions). Once rice is fully cooked and removed from heat, add the Chop the roasted tomato and the scallions and add them to the rice, along with the cumin, paprika, lemon zest, juice and the remaining tablespoon of butter. Taste for seasoning, adding salt and pepper to taste (if using stock, you’ll need little or no salt). 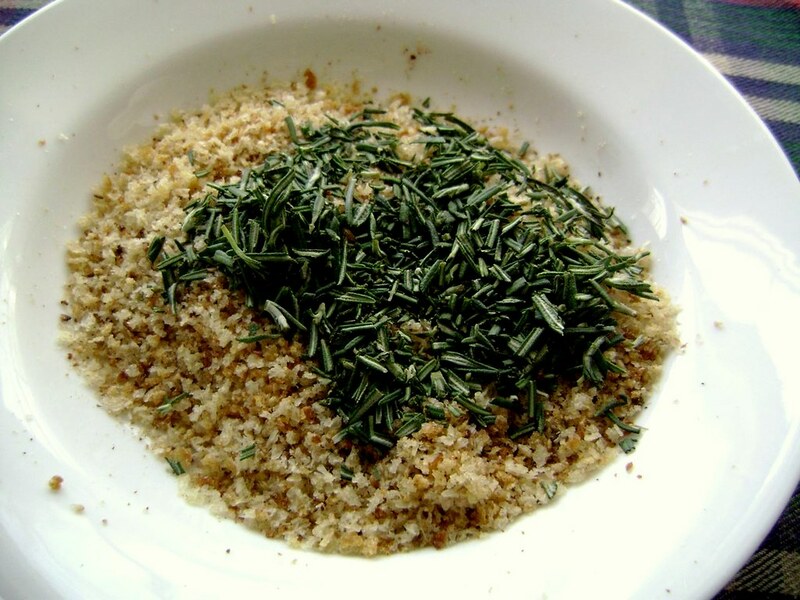 Combine the breadcrumbs and rosemary in a bowl. Remove the garlic pieces from the racks of lamb and reserve them for later use. Place the racks fat side-up on a roasting pan. Cover the bones with two sheets of aluminum foil to prevent them from burning. Pat the breadcrumb mixture onto the tops of the racks. Roast at 500 degrees for 10 minutes, then reduce heat to 400 degrees and let cook another 20 minutes, or until the internal temperature of the deepest part of the meat reaches 125 degrees (for rare) or a little more for rosy-rare. (Remember that meat will continue to cook after removed from the oven.) While it cooks, bring two cups of water to a boil in a pot with a steaming rack large enough to fit the asparagus (or place a plate inside a large, covered skillet with water on the bottom). Sprinkle the asparagus with a pinch of salt and steam the asparagus about 5 minutes or until just tender. Once the lamb is cooked, transfer to a carving board and let rest 5 minutes. In the meantime, heat the roasting pan with the drippings, any fallen breadcrumbs (the sauce will get strained) reserved garlic, shallots, thyme sprigs and the wine on the stove over high heat. Let boil rapidly, while stirring, about 5 minutes or until the liquid has reduced by at least half. Add a little more water if it evaporates too quickly, or cook longer if necessary. Pour over a strainer into a bowl. Taste for seasoning. 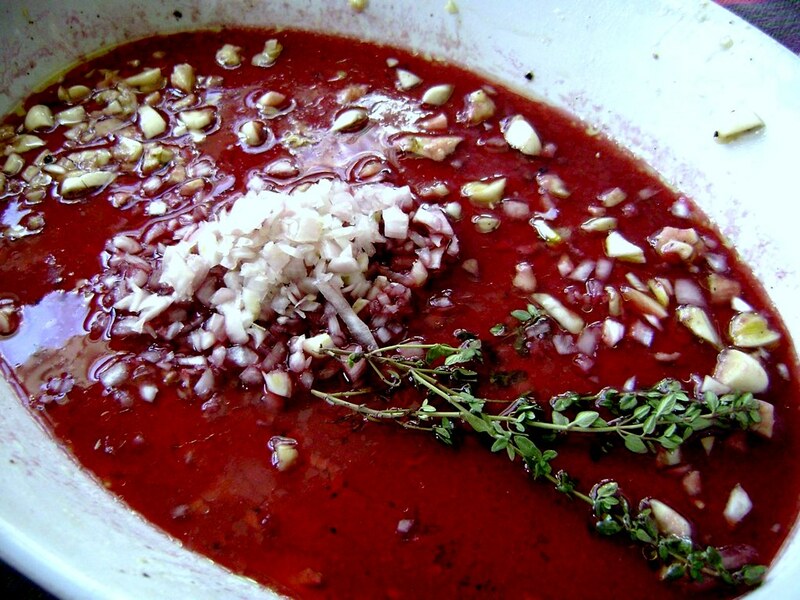 You may want to pour the mixture into the pan for more reducing if the sauce looks too thin. You can also add a tablespoon of butter to thicken it (or a tablespoon of melted butter mixed with a half tablespoon of flour). Plate the wild rice first, and top it with the lamb. Arrange the asparagus, and top with the sauce. Serve immediately. Four brownie points: Bear in mind that a really elegant meal like this in any restaurant will probably run you upward of twelve brownie points given my little scale here, but for me, any chop is a chop, and that means rich, rich, fat-encircled meat. (It depends a bit on how well you trim it, too.) It’s best to pair it with light sides, so I’ve given this wild rice ragout some fresh veggies for flavor, rather than cream or hoards of butter. Asparagus, while they may not yet be in season, are known low-calorie veggies rich in Vitamin K and folate, in particular, and here they’re just lightly steamed to keep it all packed in there. Wow. When I saw the first photo I thought it was a restaurant meal! Just beautiful. Such a beautiful Easter dinner! If you want to get your uncle to like lamb, make it in a spicy Indian lamb curry. It hides the funkiness really well. Heh, I’ve just gotten up to the part where Scott makes a rack of lamb and am now dying to go to Ottomanelli’s for some meats! 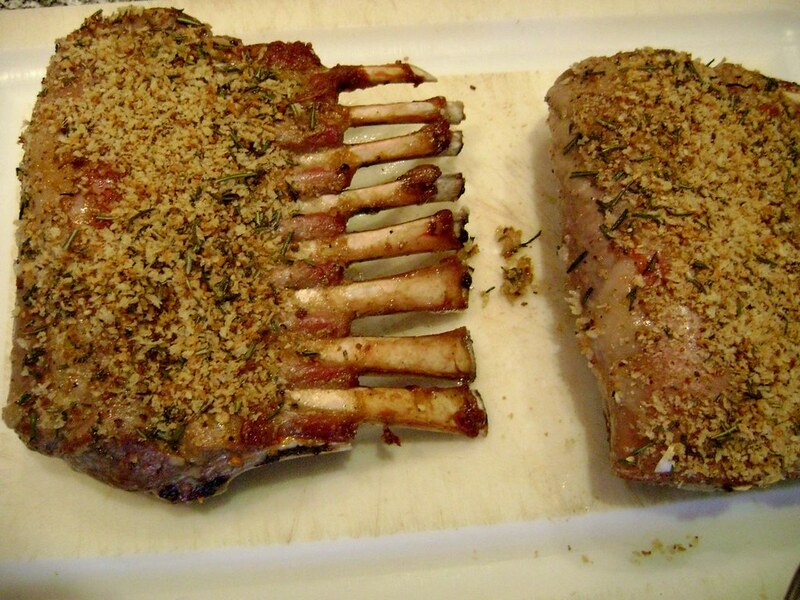 Hi Yvo: It was actually in northeast New Jersey that the fabulously inexpensive Costco lamb racks were found. It was probably an Easter sale. I think it’s terrible that you felt compelled to mention the fact that your uncle is Chinese, as if to imply that he hates lamb because he is Chinese. And to compare that with your “refined” tastes is completely offensive. The ingredient list here is confusting. 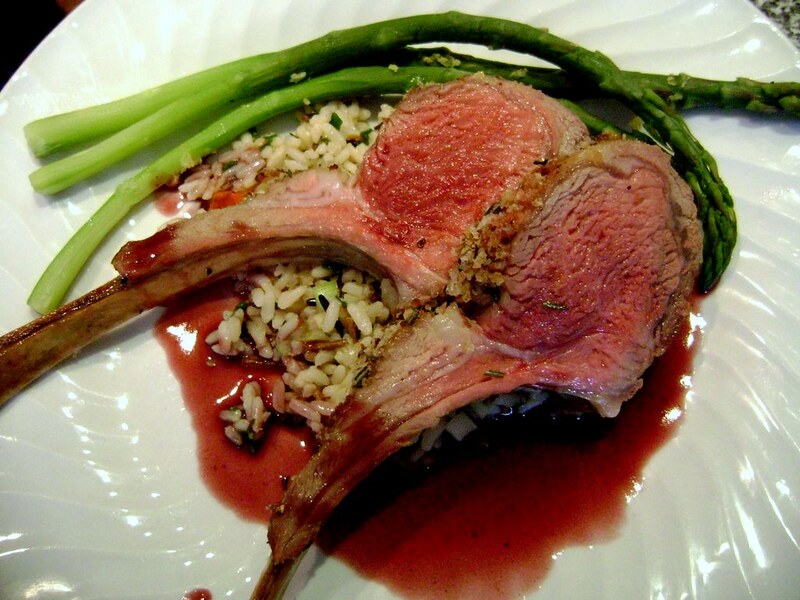 An 8-rib rack of lamb is, on average, 1 1/4 pounds. There’s no way that 2 racks could weigh 7 lbs. Jen: I think you misunderstand the part where I said lamb seems more refined to me, because I associate it with holidays/fancy restaurants. Not that my taste is refined. I think it’s interesting that most of my Chinese family and friends find its natural gaminess a deterrent, and Chinese cuisines tend to flavor lamb heavily. As for the rack weight, FreshDirect estimates 6-8 lbs for a full rack. 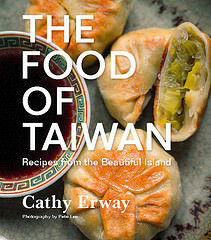 Wow Cathy! I wanted to make something different for Christmas and I now have the PERFECT recipe! Thanks! Classic Craftsman chair and tables. you really thought things out before posting this article. great stuff, if u ask me.